The correspondence of Harald Appelboom and Carl Gustaf Wrangel at the National Archives in Stockholm is an extremely rich source for historians researching the 17th century. 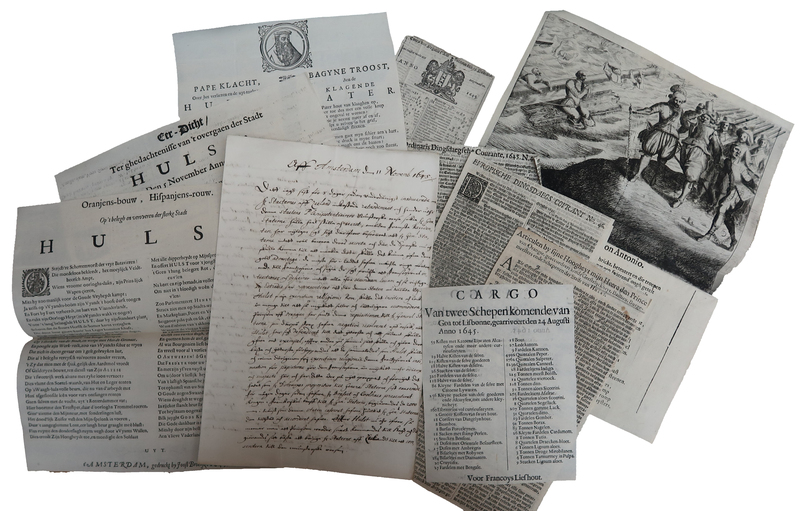 Not only because the letters themselves provide insight in contemporary events, but probably even more because Appelboom added pamphlets, newspapers, price lists and other printed sources to the letters that he sent. The correspondence between Wrangel and Appelboom is part of the Skokloster archives at Riksarkivet in Stockholm. Carl Gustaf Wrangel (1613-1676) was a Swedish statesman and military commander. He fought many battles, held several high-ranked positions and owned estates all over northern Europe. One of these places was the Baroque castle Skokloster that he built between 1654 and 1676. Today, the castle is a world heritage site that holds a library, an armory and all kind of collections that came from all corners of the world, ranging from paintings from the Dutch Republic to a Greenland kayak. Wrangel had agents across Europe who provided him with information and the luxuries that he required. One of these agents was Swedish diplomat Harald Appelboom (1612-1674). Appelboom had studied at Franeker University, lived in the Dutch Republic for years and was a correspondent of Wrangel for decades. In total, the archives hold 728 letters from the period between 1644 and 1674 from Appelboom to Wrangel. In these letters, Appelboom reported on political and social affairs in the Dutch Republic. Interestingly, to several letters he added printed topical texts that were no doubt useful for Wrangel and other Swedish officers. He compiled, in other words, a clipboard of information that gives an insight of what was going on in the Dutch Republic at a specific point of time. One of the first letters that has accompanying material laid in is dated 11 November 1645. As an example of how these letters are compiled, I will give an overview of the information that Appelboom sent to Wrangel. The main topics of the letter is the siege of Hulst, which took place between 7 October and 4 November 1645 and would turn out to be the last major siege of the Eighty Years’ War. In an attempt to advance to the city of Antwerp, Dutch troops conquered the heavily fortified city of Hulst and gained control over the river Schelde. Appelboom informed Wrangel on the events and added three broadsheets about te siege of Hulst to the letter. The broadsheets all contain poetry, arguably not the kind of material that Wrangel needed as a military commander. Even though there was no strategic information in the poems, they did sketch the current state of affairs in the Dutch Republic. Relations between social groups, religious tension and the general atmosphere in the country. It may be for that reason, that Appelboom included an undated broadsheet on the naval battle by Duins, between the Spanish fleet commanded by Antonio de Oquendo and a Dutch fleet under the command of Maarten Harpertsz. Tromp. It was not a recent event, the battle took place on 21 oktober 1639, but given the number of poems, broadsheets and prints that were created in the following years, it continued to be of importance in the Dutch Republic. 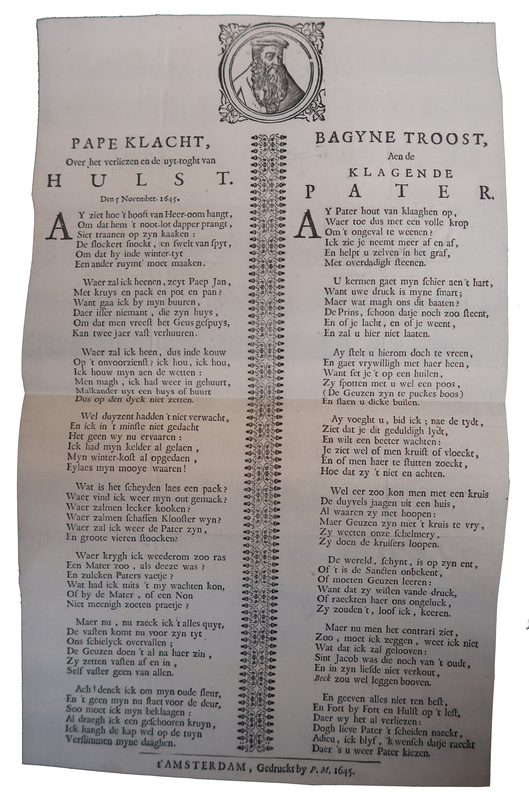 The final piece of information on Hulst was a folium, printed on both sides, with the conditions and privileges of the city. Some other documents that were attached to Appelboom’s letter were of economical interest. A price courant of 7 November was included, containing all the latest prices in Amsterdam for commodities such as grain, flax, timber, iron, sugar, soap and hundreds of other things. This Cours van negotie t’Amsterdam was one of the more common publications in the 17th and 18th centuries. According to the Encyclopaedia of Dutch Periodicals nearly 12,000 issues of the price courant might have appeared between 1609 and 1812. It is thought that they were published weekly on Mondays, and for some time on Saturdays, but this copy is dated 7 November 1645, and that happened to be on a Tuesday. Cours van negotie t’Amsterdam, 7 November 1645. For Wrangel it may have been interesting to see what prices were in Amsterdam, but for the merchants and industrialists in Sweden it was vital to keep track of economic trends. The entire industry depended on te prices they would get in places like Hamburg, Lübeck, Danzig, London and Amsterdam. Copies of the price courant must have been all around in the harbors of the Baltic Sea, but very few survived. They simply lost their relevance when a new issue with the latest prices became available. 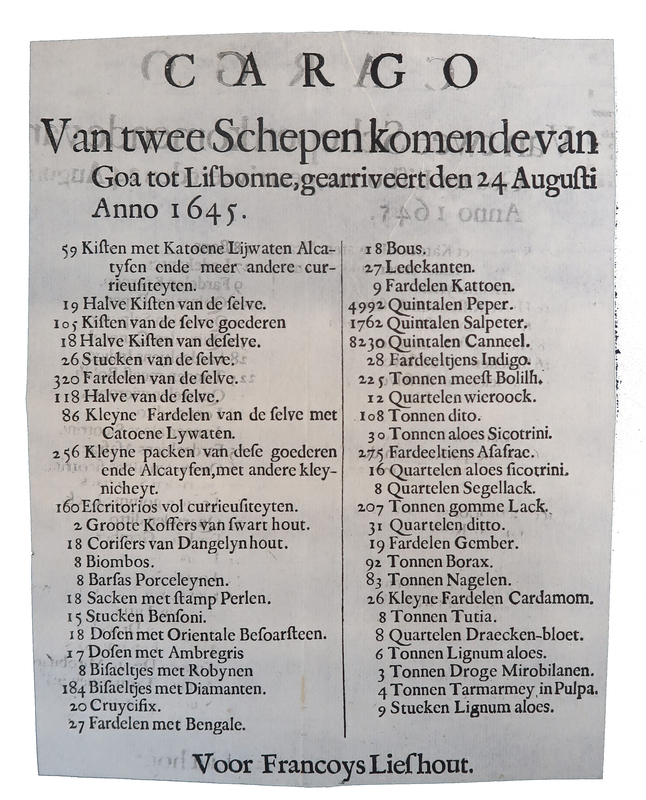 Also included in the scrapbook of Appelboom is a broadsheet entitled Cargo van twee schepen komende van Goa tot Lisbonne (Cargo from two ships coming from Goa to Lisbon). It is hard to understand what kind of information is communicated here, other than that the luxury trade of the Portugese brought them incredible wealth. Similar descriptions of rich cargo from the east are found regularly in newspapers from the same period, and this no doubt captured the imagination of contemporaries, but Wrangel certainly had better things to do than to muse about the riches of the East, or had he? Finally, the letter contains four different newspaper issues, the Ordinarisse middel-weeckse courante no. 46 (14-11-1645), the Ordinaris dingsdaeghse courante no. 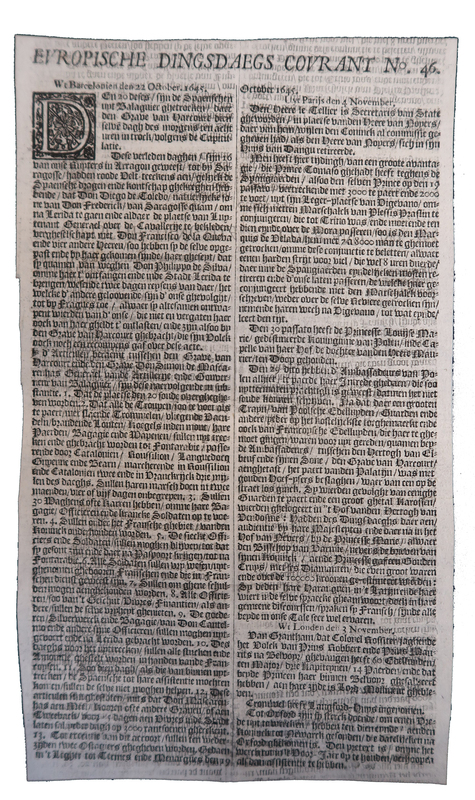 46 (14-11-1645), the Europische dingsdaegs courant no. 46 (14-11-1645), and the Ordinarissen postilion no. 91 (10-11-1645) This last one was printed in Antwerp, the other three in Amsterdam. They were hot off the press when Appelboom sent them, three of them even postdate the letter by three days. The postilion contains some of the latest news from Germany, with specific information on Swedish progress in the war. Wrangel was surely keen to read about this success. The other newspapers contain reports from all corners of Europe. If Appelboom did not mention specific events in his letters, we can only guess what might have attracted the interest of Wrangel. In general it must have been intelligence. Military, social, economical and cultural, to understand the world, gain military success and fill his castles with riches, Wrangel needed every piece of information. Our challenge is to reconstruct the information networks that he had built. This blog post covers one letter from 11 November 1645, the titles have been added to the Short-Title Catalogue, Netherlands. We better get started on the other 727 letters. Oranjens-bouw, Hispanjens-rouw. Op’t belegh en veroveren der sterke stadt Hulst. – Amsterdam, printed by J. Broersz, 1645. Eer-dicht, ter ghedachtenisse van’t overgaen der stadt Hulst: den 5 november anno 1645. – Amsterdam, printed by G. Willemsz, 1645. Pape klacht, over het verliezen en de uyt-toght van Hulst. Den 5 november. 1645. – Amsterdam, printed by P.M. [=Paul Matthijsz? ], 1645. Articulen by sijne hoogheyt mijn heere den prince van Orangie, geaccordeert aende geestelijckheyt, baillieu, burgemeesters ende schepenen der stadt van Hulst. – S.l., s.n., . Den wanhopenden Don Antonio. – S.l., s.n., [c. 1640?]. Copie van twee brieven, d’eene gheschreven uyt Toorn, ende d’ander uyt Danzick. – S.l., s.n., 1645. Cargo van twee schepen komende van Goa tot Lisbonne, gearriveert den 24 augusti anno 1645. – [Amsterdam], for F. Lieshout, . Cours van negotie t’Amsterdam (7-11-1645). Ordinarisse middel-weeckse courante no. 46 (14-11-1645). Ordinaris dingsdaeghse courante no. 46 (14-11-1645). Europische dingsdaegs courant no. 46 (14-11-1645). Ordinarissen postilion no. 91 (10-11-1645).